This is the best scenario to watch cars, trucks, and buses go flying off a mountain because it's a simulator so nobody gets hurt in the process. So you can watch minutes of destruction happily. YouTube channel, Destruction Nation, has posted several videos that are incredibly entertaining to watch. Everything from the ridiculous 100 speed bumps in a row to wild crashes like these. The simulator used is called BeamNG Drive and it's a video game developed in Germany. And although we've watched (and posted) several of these videos for your enjoyment, the best one might be this "Cliffs of Death" video. There's not a whole lot that's more entertaining than watching empty cars get flung off a ridiculous cliff and go tumbling to their death, sometimes ending in a fiery pile of metal. And while we realize these aren't real cars and may just be a way to kill time at the end of the day, it's a pretty good option if you ask us. If you're not careful you may find yourself 20 videos in and have an hour or two go by, lost from your day. So if you have a lot of work, maybe save this tab and come back to it later. Or watch it now and apologize to your boss later. Caption This! 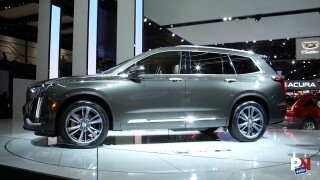 What Happened To This SUV?